The President of the United States of America (or POTUS, as those of us in “the know” refer to him) did not return my calls. That’s right, before our family’s recent trip to Washington, D.C., I tried my best to arrange a drop in visit with Mr. Obama. Apparently he was “unavailable”. Why the leader of the free world can’t spare five minutes for a meet and greet and to pose for a quick picture with my adorable family, I don’t know. You’d think he has a country to run or something. Despite this slight, we enjoyed a delightful stay inhis territory, visiting the US Capitol, the myriad of fabulous free museums and memorials, and eating at a couple of delicious restaurants, including (rumor has it) one of Michelle Obama’s favorites for date nights with the POTUS. We planned our trip smack dab in the middle of July, when the temperature in Washington, D.C. is high, and the humidity even higher. And boy was it hot. It made me feel sorry for all the poor souls who have to work in suits and stockings. We made the best of the sticky conditions though, spending as much time as possible in air-conditioned buildings and museums. Somewhat surprisingly, one of our favorite sites was the US Capitol. 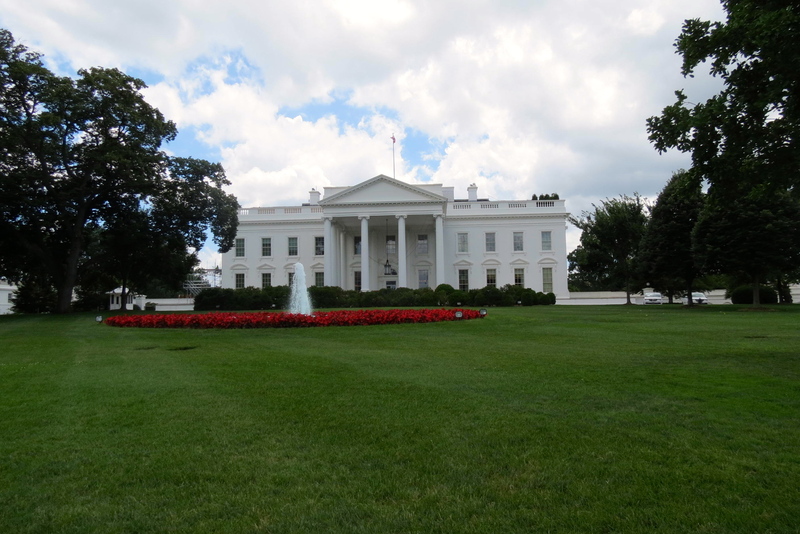 I contacted Congressman Greg Walden’s office well in advance of our trip, with the hope of arranging a White House tour (and the above mentioned meet and greet with the POTUS). Unfortunately, the budget sequestration has put a halt to White House tours. Thus I opted to sign us up for a tour of the Capitol. We met at Congressman Walden’s office, and one of his interns, a student from Linfield College in McMinnville, Oregon, gave our family and three other women a private tour. The women were visiting from Arkansas, and in town to see Barry Manilow, among other things. “I’m a Fanilow,” one woman told me. That’s right, a Fanilow. But I digress. 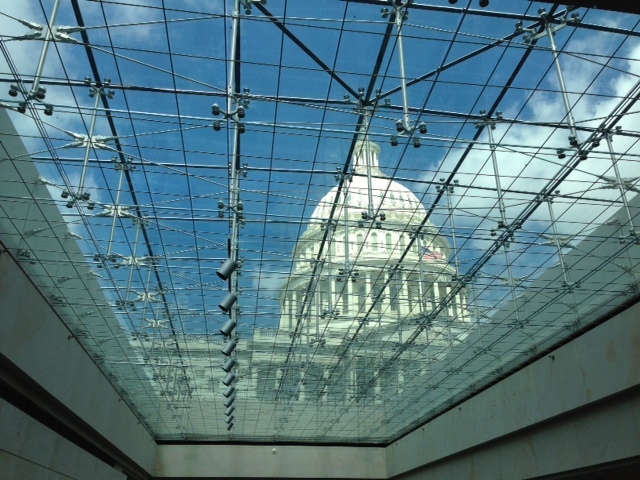 We passed through underground tunnels from Walden’s Congressional offices to the Capitol, saw the old Supreme Court Chamber, viewed the beautiful Capitol Rotunda from underneath, and enjoyed the “behind the scenes” stories of both the building itself and of a great number of its historically significant paintings and statues. We even got to sit on the House floor, thanks to one of the three women personally knowing a staffer in Walden’s office. We found the private tour arranged through our Congressman’s office far better than the public tour, arranged through the Capitol Visitor’s Center. It looked as though each of those tours had over 100 people, as opposed to our small group of seven! While we visited almost all of the free museums, the National Galley of American History was our favorite. Perhaps its collections are more relevant to us, perhaps it was because the Air and Space Museum was crazy, shoulder-to-shoulder crowded, but I didn’t find the Air and Space Museum nearly as interesting as the American History Museum. One of my favorite exhibits was Julia Child’s kitchen. Relocated from her home in its entirety, one look and there was no question that this woman lived to cook. Another museum that we all enjoyed was the National Portrait Gallery. It houses great portraits of US presidents, many of whom chose who would paint their picture to hang in the gallery. It also currently hosts a memorable photo exhibit of Martin Luther King, Jr., marking the 50th anniversary of the March on Washington. 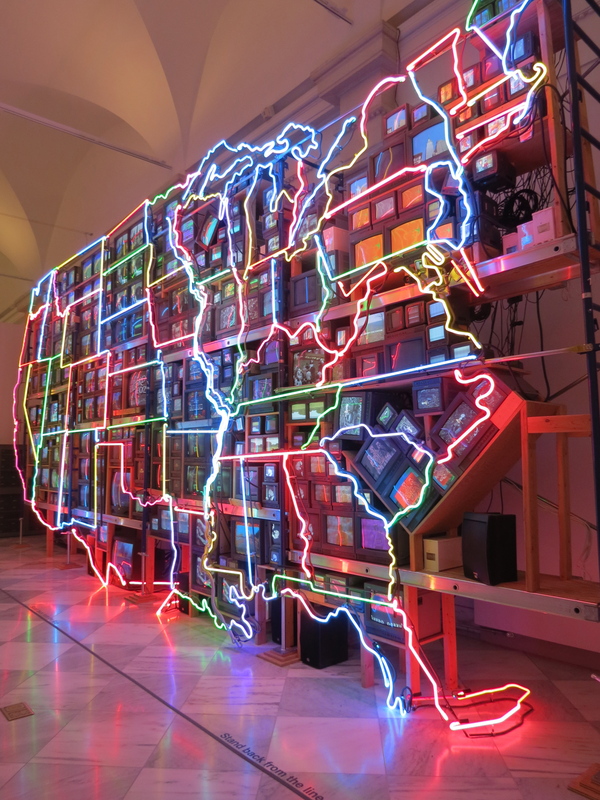 Another great exhibit in the American Art Museum, which is attached to the National Portrait Gallery is the Electronic Superhighway, by Korean artist Nam June Paik. This exhibit tells the video story of each state in the US. Some states have movies playing, like the Wizard of Oz for Kansas, while others have important moments in history. It is a fascinating look at our country through the eyes of television. We did pay for one museum in D.C., the Museum of Crime and Punishment. On my last visit to Washington, D.C., a mere 25 years ago, I toured the FBI building and museum. For security reasons this is now closed to the public, and the Crime & Punishment museum has (sort of) taken its place. While the museum was interesting, with highlights of major crimes and criminals from the last century, it seemed a little weird to me, as if I was celebrating evil. Did I really need to see Ted Bundy’s VW bug? I’m glad we didn’t pay full price for the tickets, as we bought them on Groupon for half price. 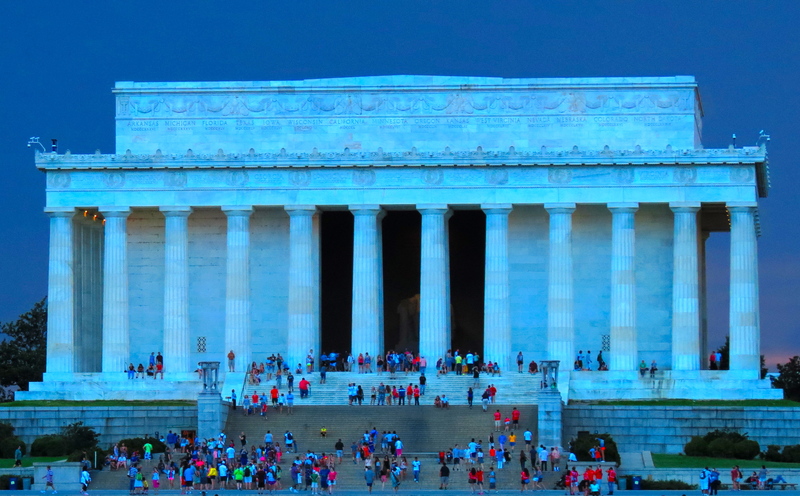 We waited until dusk one evening for our very own, self-designed and guided walking tour of DC’s important monuments, including the Jefferson Memorial, MLK Memorial, Lincoln Memorial and Vietnam Memorial. This kept us from overheating and dehydrating, and turned out to be a somewhat crowd-free experience. Most of the museums are open until 7:30, and the memorials all night long. And that 5pm-9pm window is key, as most tourists have already left for the day. By the time we left the Museum of American History, at about 7pm, it was nearly empty! Our evening memorial walk ended with an impressive dinner at Founding Farmers, perhaps the best meal of our trip. FF is owned by a collective of American family farmers, and features farm-inspired food like fried green tomatoes and fried chicken and waffles with gravy, with regionally sourced and natural ingredients. Everything we put into our mouths, from my Southside cocktail with muddled lemons and beefeater gin, to Emily’s handmade butternut squash ravioli, to Bob’s spicy sausage, shrimp and grits, and to my southern fried chicken with mashed potatoes, gravy and a waffle, was utterly delicious. We finished our meal with a slice of Farmer Ellen’s carrot cake and were surprised at the moderate bill, $134 for four before tip, with appetizers, three drinks and dessert. Quite a bargain really. Another great D.C. meal was breakfast at Market Lunch, in the Eastern Market near Capitol Hill. Featured on Diners, Drive-In’s and Dives, Market Lunch is famous—funny enough—for its breakfasts, and they did not disappoint us. 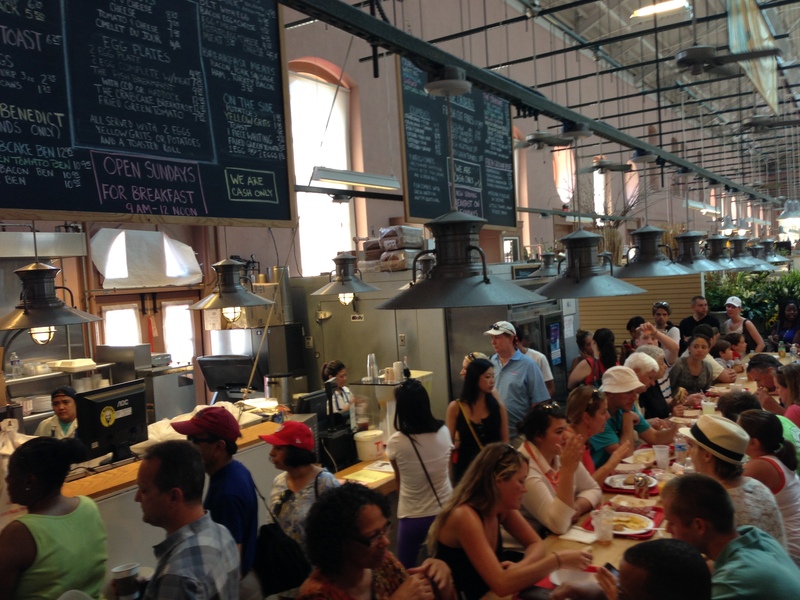 We waited in line about 30 minutes to order and pick up our food, but a long line is always a good sign in my book. I was delighted with my crab cake eggs benedict, and Bob with his fried green tomatoes and buckwheat blueberry pancakes. We stayed at the Capitol Skyline Hotel, within “walking distance” of the US Capitol. True, but the walk is not very nice, and the neighborhood of the Hotel, near the Washington National’s ballpark, is just a little sketch. Plus, on arrival, we learned that the Hotel hosts “pool parties” on the weekends, free to hotel guests, but not any kind of party I’d want to go to. Think MTV-style loud thumping music, and scantily clad twenty-somethings. We used the convenient Metro system when we got tired of walking. But, as each subway ride cost $2.70 per person, we soon realized that door to door cab rides for four are a much better value and often even cheaper than the metro. When you’re walking, sites in D.C. turn out to be much farther apart than they look on a map. Maybe it’s the heat? All I can say is the POTUS is lucky he gets driven everywhere.